Mongla Port Authority Job Circular 2019 has been found of their official website (www.mpa.gov.bd) with all needed information. This organization is one of the government organization in Bangladesh. If you build your life as Government service holder you can apply here and try to join with Mongla Port Authority this job circular. We have also published the job circular of our website with all Requirement of Mongla PortAuthority. Eligible candidates such as male and female can be applied here following circular requirement. So every candidate can be applied here. You found all kind of information on our website(eresultsbd.com). The author gives some Career opportunity for new joiners. Circular related all needed information has been fou on my website (www.eresultsbd.com). We will also publish this circular Exam date, Exam result, and others. Mongla port authorities are recruiting various categories of the job position. This job offer is the most important matter for any unemployed people who want to do in this sector. Mongla port authority is the most valuable part of our country. Mongla port authority is the most popular zone in Bangladesh. With the job chances in Mongla port authority, anyone can take this opportunity. Mongla Port Authority will appoint manpower according to government pay structure in different posts. You can build your future through this job. You must have the necessary qualifications according to the employment rule. About Mongla Port Authority: Mongla Port Authority is an autonomous organization responsible for Mongla Port and is located in Mongolia, Bangladesh. The port authority was established in 1987. In 2013 Mongla port awarded the contract for 5 vessels from Timblo Drydocks in Goa, India. Mongla Port Authority Chief Engineer Altaf Hussain was under investigation of Bangladesh Anti Corruption Commission for alleged grafts in awarding contracts. The same year the port authority signed a 250 million USD deal with China for the modernization of the Port. Dredging Corporation of India won a 1 billion rupee contract to dredge Mongla port from Mongla Port Authority in 2018. Bangladeshi all circular is updated on my site eresultsbd.com and we also published the learning based post on our site. you visit our facebook group (be practice English). this is the most important for the students. If you want to join in Mongla port you fill up requirement what want authority. Jobs Post name is the senior medical officer, Dental expert, eye expert etc. If you think you are the right person for the post you submit your CV to authority. Bangladeshi citizen can be applied here. Bangladesh Port authorities announce a circular. If you think you submit your CV you fill up correctly. 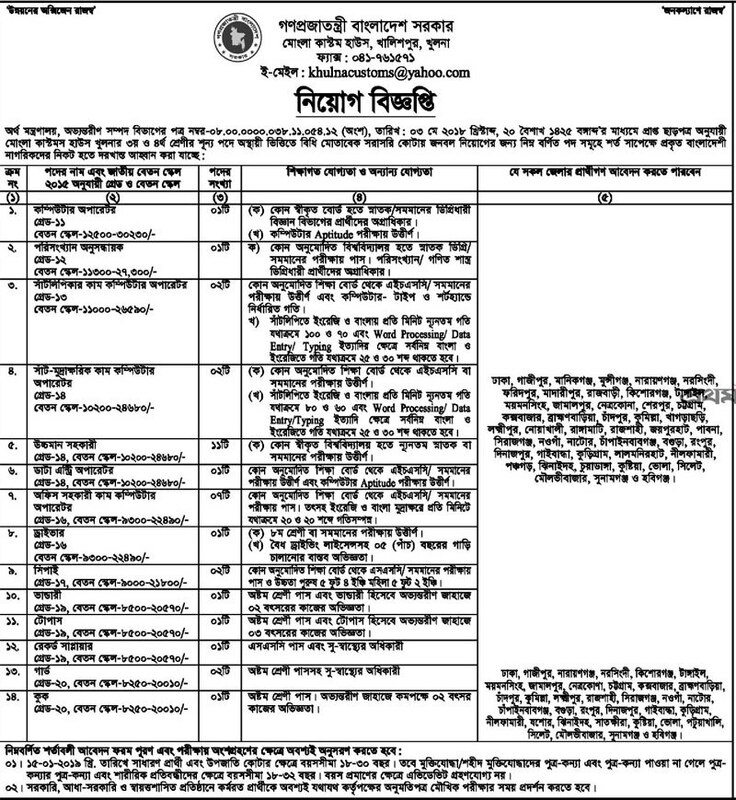 The Authority of Mongla Port Authority Jobs circular 2019 was published some days ago. If you want to join in Port jobs you try again. Bangladesh has many port job such as Chittagong port and, others. you have must follow a circular procedure. I think you are so genius and talented. You fill up Mongla port Authority jobs circular 2019 form. You must fill up the application form within authority declared date. You submit your CV as soon as possible.